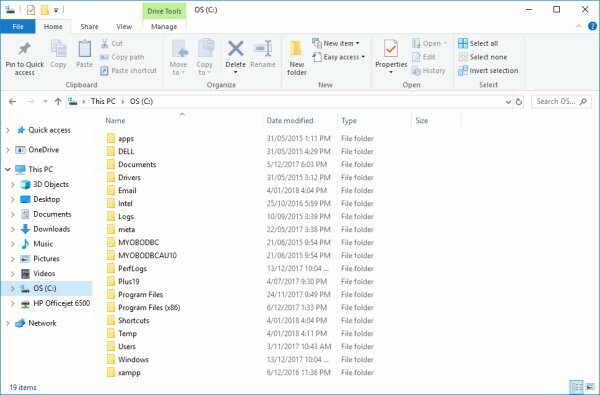 Last week one of my clients experienced a hardware failure on their main computer. It’s most computer users worst nightmare. In the middle of an important few days of work and your computer fails. Long story short, a new hard drive was found and installed, and so the process of restoring the computer from a backup began. Thankfully all data was restored successfully in most part due to the client initiating a backup process approx 6 weeks ago – just in the nick of time! If you don’t have a backup process in place see my post about Backing up using File History (Windows 10) or Backup using Windows Back and Restore. Anyway, as part of the restore process, I went through and made customisations to the Windows 10 interface so that the client had as many of their old customisations as we could remember. One of those customisations was a shortcut to a specific folder in their file structure. As I was creating the shortcut, I realised I did not have this posted online so here I am today adding it. 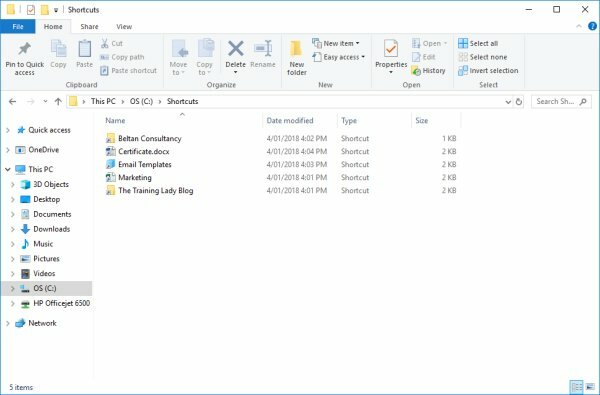 In my example, I’m going to create a shortcut to my blog content folder which is located within the Documents folder. Select the folder and click OK. In todays post I am going to show you my favourite keyboard shortcuts for Microsoft Word. You may have noticed that I’m a fan of efficiency. If there is an option to do something faster in any of the Microsoft programs then I use it. 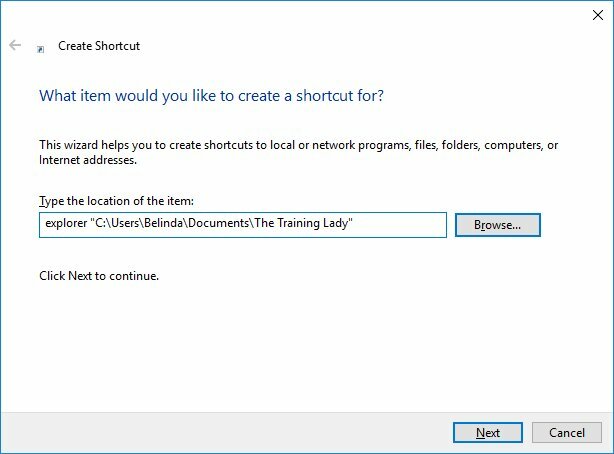 During any of my training courses, I spend a good slice of time at the beginning showing participants my favourite shortcut key combinations for the specific program we are looking at. I then reference these shortcuts throughout the day in the hope that by the time participants get back to their desk the next day, at least a couple of the shortcuts have stuck in their minds. 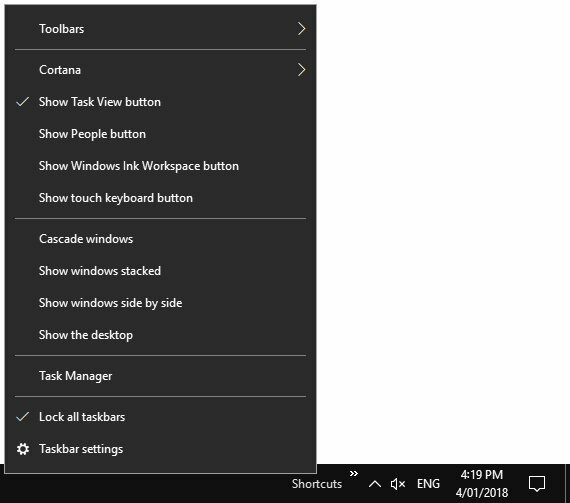 For the most part with keyboard shortcuts, I feel that the ability to keep your hands on the keyboard instead of having to move your hand to the mouse, locate the cursor on the screen, move to the location you want on the program window and click a button, is much more efficient in your daily routine. Once you can memorise these combinations you will be working in a much faster and more efficient way. So today I’m going to go through my favourite and the most efficient shortcut keys in Microsoft Word. 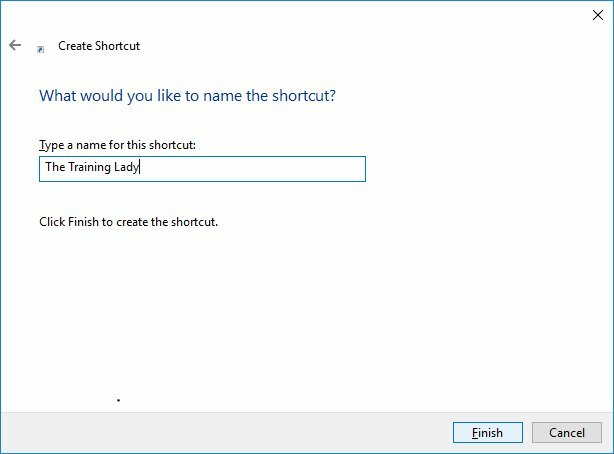 The great thing about many of the shortcuts I mention here is that they can be used in many of the different programs. To download this list in PDF format, simply scroll to the bottom of this post. Ctrl + N Create a new document. Don’t go to the File tab or the Office button; just press this combination for a new blank document to appear. Ctrl + O Open a new document. This will display the Open window from Backstage view allowing you to navigate the list of Recent Documents you have accessed or Browse your computer. No need to go to the File tab or Office button for this function. Ctrl + F12 Open a document whilst bypassing the Backstage view window and go directly to the Open dialog box. 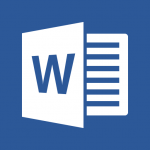 Ctrl + W Close the current document whilst leaving Microsoft Word open for your next task. Ctrl + S Save the document. 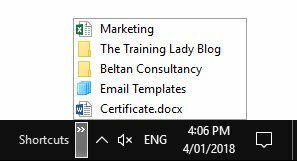 If you have not saved the document prior then you will be prompted to give the document a file name and specify a location. If the document has already been saved before it will save any changes you have made since opening or since you last pressed save. F12 The F12 button will automatically perform a Save As regardless of if the file has been saved before or not. Ctrl + B Apply the Bold formatting. Simply highlight a word, sentence or entire paragraph and press this combination to apply bold. Ctrl + I Apply the Italics formatting. Simply highlight a word, sentence or entire paragraph and press this combination to apply italics. Ctrl + U Apply the Underline formatting. Simply highlight a word, sentence or entire paragraph and press this combination to apply underline. Ctrl + C Performs the Copy function. You can highlight a word, sentence or entire paragraph and press this combination to copy the text including the formatting. Ctrl + X Performs the Cut function. You can highlight a word, sentence or entire paragraph and press this combination to cut the text from its original location. Ctrl + V Performs the Paste function. Use this to Paste anything you have previously cut or copied. Ctrl + Z Undo. Undo. Undo. Need I say more? If you make a boo-boo, undo. I often have people will hit a key on the keyboard or click something on the mouse and they have no idea what they did, just UNDO.. You can press this multiple times to undo multiple things. Ctrl + A Use this combination if you want to select an element or object in your document. For example, place your cursor inside a table and press Ctrl + A and it will select ALL of the table. Or have your cursor anywhere in your entire document and press Ctrl + A to select all the text. Ctrl + L Make the selected paragraph Left aligned. Ctrl + R Make the selected paragraph Right aligned. Ctrl + E Make the selected paragraph Centre aligned. Ctrl + J Make the selected paragraph Justify aligned. 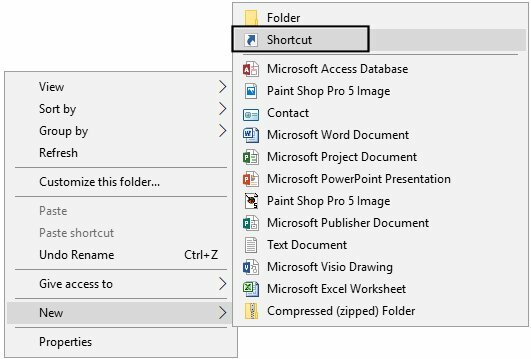 Ctrl + P Print the current document, this shortcut combination will open the Print Preview window. Ctrl + ] Increase the font size. Keep pressing this combination to keep increasing font size. Ctrl + [ Decrease the font size. Again keep pressing this combination to keep decreasing the size. Ctrl + Home Move your cursor from anywhere in your document, back to the start of the document. Just press the Home button without Ctrl to move to the start of the current line in your document. Ctrl + End Move your cursor from anywhere in your document, to the end of your document. Just press the End button without Ctrl to move to the end of the current line in your document. F4 This is one of my favourites! F4 = repeat! If you have just highlighted some text and applied a specific numbered list, highlight the next text and press F4 and it will repeat the last step for you. If you have just added a new row to a table, press F4 and it will add another. A big time saver! So there is the list of my favourite shortcut key combinations. These combinations are the ones I use most often. 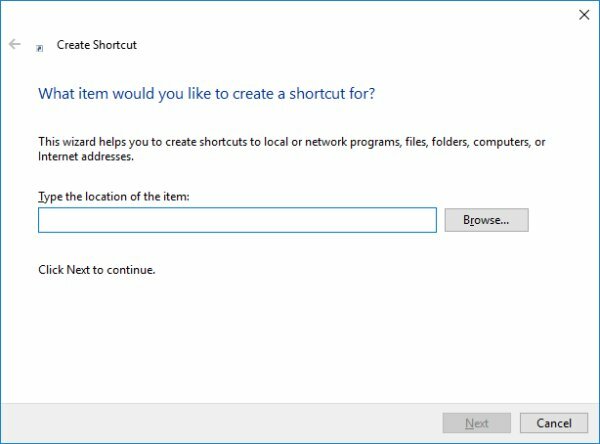 There are of course lots more shortcut key options available which you can see by accessing the built-in Microsoft Word Help feature (Shortcut key F1) and search for keyboard shortcuts. I hope these shortcut keys can help to improve your efficiency when using Microsoft Word. I love hearing about shortcut combinations that other people use so feel free to comment below if you have a favourite combination not listed here. If you would like to print a copy of these shortcut keys I have included a printable PDF file for download below. Be sure to check out my other posts for keyboard shortcuts to use in Microsoft Outlook, Excel and PowerPoint. Generally, I like to try and keep an organised desktop area and where possible keep my files in a somewhat organised fashion. I have files which I use on a regular basis such as budgets, accounting files, and other such things, however, I don’t want to have these saved on my desktop. Having lots of files on your desktop means you need to search to find what you are looking for which tends to be counterproductive. 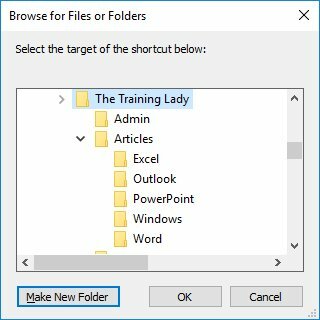 A fantastic way to organise shortcuts you use on a regular basis is by creating your own custom toolbar menu which you can then display on the Windows Taskbar and have easy access to whenever you need. 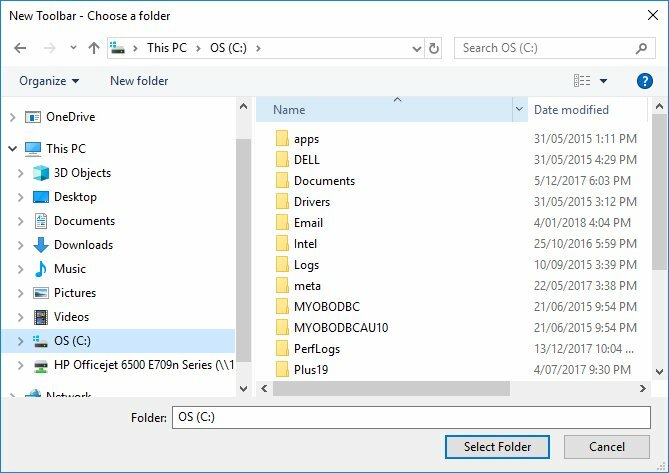 To create a custom toolbar menu you simply create a folder on your computer and place any shortcuts you wish to access inside the folder. The folder then acts as your own shortcut menu which you can access via the Windows Taskbar. I hope you have enjoyed this customisation. If you liked this customisation, you will also like my post on how to Pin an application to the start menu.